Windows 7 has no notification of RAID failure? This is a repost of this thread: http://social.technet.microsoft.com/Forums/en-US/w7itprogeneral/thread/a77c6445-e504-4394-a945-7a6c096e0871 Per Technet, being a subscriber guarantees me a response from a Microsoft Engineer within two business days, but the previous thread was not answered satisfactorily, and now Microsoft seems to be ignoring it. Since my previous thread went unresolved and this is of critical importance, I chose to repost this and get a real answer from Microsoft. Having Software RAID as a built-in option seems like a great idea. Hard disks are notoriously unreliable, and they carry the most important part of our technological world: our data. Being able to easily build a software RAID from two cheap 1TB drives gives me so much piece of mind ... or does it? I've noticed my software RAID seems to be periodically losing sync. * This is worrisome (maybe a drive is failing?) but not nearly as worrisome as HOW I noticed it. For some reason, after cruising along smoothly for several months with my RAID 1, I decided to check on its status in Computer Management -> Disk Management. And, oh nos! there was my software RAID with a Failed Redundancy Error. I had to "Reactivate Disk" and it started resynching. I decided to check again every so often and everything was fine again for a while until I lost synch again. Again, my losing synch is not the point of this post. My point is why was there NO NOTIFICATION of my synchronization loss? I have NO IDEA how long my drives had lost synchronization before I stumbled upon that fact the first time. What is the point of software RAID if Windows does not inform you that it has failed? I could lose one drive, go cruising along for months thinking I'm fine, then lose the other drive and POW! I'm left with nothing due to a false sense of security (please no lectures on RAID being for reducing downtime and not for use as a backup solution - I KNOW). I just had another loss of synchronization, and I checked around to see if I had been notified anywhere else (the Action Center seems like it could be a good candidate for this). Finding nothing, I've come here to post my concerns. But in order to maintain my required level of uptime, I need to KNOW when a drive has failed redundancy so I can correct the situation (by replacing the drive or other). Where is the notification that I am running on only one drive? Update: In the previous thread, it was suggested I use the Windows Task Scheduler to make my own custom notification based on RAID failure events in the Event Viewer. After investigating this unnecessarily obtuse (but usable) solution, it was found that Windows 7 does not generate any events for RAID synchronization failures. This is astounding. What I really want is graphical, e-mail, and event notification of a drive failure. I will take just an event. I find it amazing that the new "Action Center" thinks it is important enough to tell me that my Flash player has a problem, but can't let me know that a drive is failing. This seems like the perfect job for an OS notification system: to warn you when the feces is about to impact the ventilator. *Update: the disk in question ended up dying completely and was replaced under warranty with no problems and the machine is now happily cruising along with 2 working and synchronized hard drives once again. I would have never noticed I had a failed hard drive if I didn't check on my own. This is a repost of this thread: http://social.technet.microsoft.com/Forums/en-US/w7itprogeneral/thread/cf7b9cf1-5002-4cdf-9efd-a793b9202077/ However, this time I am using my company's Technet subscriber account instead of my personal account. Per Technet, being a subscriber guarantees me a response from a Microsoft Engineer within two business days. Since my previous thread went unresolved and this is of critical importance, I chose to repost this and get a real answer from Microsoft. *Update, the disk in question ended up dying completely and was replaced under warranty with no problems and the machine is now happily cruising along with 2 working and synchronized hard drives once again. I would have never noticed I had a failed hard drive if I didn't check on my own. I do hope you get an answer to this. If the system offers RAID (where the R is for Redundant), then it really should be notifying you of a redundancy failure. I have heard it's possible to tie an action to a specific log message in the Windows logs, and the implication is that the action can be to put up a message to you, though I haven't investigated it any further yet. Have you looked into this possibility? Is there an event log message that's tied to the specific failure you're seeing? I've just done a bit more investigation, and it's actually quite easy to get an event log entry to trigger a user message. In the Event Viewer, highlight the event you're interested in then look over along the right side for the "Attach Task To This Event..." link. It's pretty self-explanatory after that. It adds an entry to the Task Scheduler. I agree with Noel, you could check if there is information about this failure in Event Viewer. If so, just try to attach a task to this event, you could create different actions to remind you when the event is logged, for example, you could send an e-mail or display a message to help you notify this event. Unless I am misunderstanding your instructions, this solution is not adequate. It presupposes that the system has already experienced a failure event, but by that time it is already too late. This solution is not useful for a brand new install or for a system that has not experienced a failure recently. How can I attach a task to an event that does not appear in the event viewer? Additionally, the event viewer solution seems far too much of an obfuscated hack for something so critical. Your instructions are simple, but relative to the importance of a software RAID, I don't think Windows should require such detailed configuration to inform you of a problem. I get notifications that my Adobe Flash player has an issue without any setup, but I have to set up a special task in Event Viewer to find out my RAID has failed? pfft. Anyway, I'll accept the hack for now if you can tell me how it would work on a new install. I agree with you that this is a weak workaround, but at least you're not completely out in the cold. Vegan, why the insistence on side tracking the conversation? Windows 7 supports software RAID and I decide to use it, then so be it. Obviously there are better solutions, but they cost time and money and there is nothing necessarily wrong with software RAID (with today's mostly overpowered systems, it actually makes more sense to use spare resources for RAID). Conversely, if Microsoft decides to include this option, the most basic feature they must include should be clear and obvious notification of RAID failure. I've also noted many times that this is not an issue of maintaining data backups but of system uptime. Do you see how unreliable this is? It certainly doesn't leave me feeling confident in Microsoft's solution. And yet, how simple it would be for them to make it something worthwhile. I'm in the same boat - kinda. I luckily haven't had a failure, but I was setting up an ICH7R mb raid which made me think to actually check this other machine with mirrored dynamic volumes. Compared to Intel's Storage Matrix Management, which installs at minimum a notification tray icon (on all non-admin users), this is extremely sad. I'll see what I can do to dish up an Event ID for you - unless someone else already has it on hand. Just completed some testing pulling disks. There are no event logs at all for a mirror-based volume failure at all. For all intents and purposes, the only indicator is within Disk Management. Absolutely amazing. So despite Noel's valiant attempt at a workaround, we are back to square one. I would really like to see a response from Microsoft regarding this. I would suggest that you open a real ticket with Microsoft on this, I see above that you mention your tech net subscription, and this is a community open forum, not a formal ticketing response system. Real tickets in the system at MS help the software and product teams address real issues with the products and help shape thier fixes and releases. I have to conciede with Vegan that if this is a critical box, that you need to go hardware raid reguardless if you get a notification on a software raid failure or not. Even with suped up boxes today, I run many servers in my lab that software raid wouldn't stand a chance with the volume of IO we crank out. Wow, does that ever stink. Who programs a RAID implementation on Windows that doesn't even log an error when there's a problem? Did Microsoft buy the software from some 13 year-olds? Hell, the system even logs the uptime, but no error in this case? That's a disappointment to say the least. I'm guessing if it's not here, it should be somewhere close. In case you find it, you can attach a task to notify the user as Noel described. If it works or doesn't please let us know. Hope it helps! I have just finished Software Raid 1 in Windows 7 Ultimate. Still No notification of failed redundancy from Microsoft ? Me too. The idea of Software Raid 1 in Windows 7 seems like a great idea ! I LOVE it very much ! But without notification of failed redundancy ?!?!?!??!?!?!??!?!?!??!?!?!??!?!?!? Subscribers now benefit from priority support in TechNet Forums. A Microsoft engineer will respond within 2 business days to your posting if the community hasn't already gotten you the answer. TechNet Forums are very active community and a great place to both get help and help others. To receive priority support in the TechNet Forums designated below, please make sure to sign in with the same Windows Live ID you use to access your other subscription benefits; no special configuration is needed. Interesting. Having been around here for a while, I've certainly seen Microsoft people respond to a lot of posts, but I'm just not perceiving what I'd call "priority support" for anyone. It really just looks like Microsoft has a (relatively small) team of nice folks who do take what people write here seriously and occasionally try to help. This is a user driven forum and you should not expect Microsoft as such to answer your questions here. For support you have to contact... support. This was true in the past, but as of a few months ago is no longer true. Did you even read my post? Therefore, since I am a paying subscriber, I "should expect Microsoft as such to answer" my question. For those who are not paying TechNet subscribers, you would be 100% correct. I'm sorry, it was not my intention to mislead you. At least I learned something new today. I'm re-commisioning 130 domain controllers as Win7 workstations for our restaurants and losing my ability to use Dell's OMSA (IPMI/WMI tool for system health alerts). I'd say the one thing I care most about is the state of affairs with my RAID arrays. If all we get is a logging/email facility, that's cool. Now how do we get a list of what those Event IDs could be that are worth emailing on? Call MS support is what I'm hearing, right? I've been around here for a while too. The priority support feature is new in the last few months which is why Microsoft's TechNet support page says "Subscribers now benefit..."
Yes, that is the part that says "...if the community hasn't already gotten you the answer." But the community has not covered this issue. I assume the "answered"/"unanswered" mechanic for the threads here is used for that purpose. I can only assume that this thread is being ignored because it was answered at one time (I didn't mark it as such), but I later unmarked it when the suggested answer became apparently useless. I'm guessing there is no mechanism for previously answered threads to go back into the priority support queue, so I have reposted the issue again (see my edited link in the OP). I am sorry to respond this post late. But I have realized this is a known issue, and our core team is working on this case. I have tested this out and am surprised at the results myself! I am going to have to to connect with some other folks and hope that there is a good reason for the omission of events. Will repost as soon as I am able to get more information. This is great news Mr. Microsoft Peoples. Thanks for the reply and update. - Choose "Attach Task To This Event..."
- Check the "open the Properties dialog for this task when I click Finish" box and click "Finish"
I'm rebuilding the array ("resynching" in Microsoft-anese). After that's done, I'll pull a drive and see if I get some emails. What are the three distinct errors? Just curious. Actually - it's very easy. Just open task scheduler and follow the prompts. You'll figure it out. Did you pull the primary or the secondary disk? Do you see the error when you pull the secondary disk? Yes, I am curious how you got a different result from everyone else that has tried so far? What happens if you pull the drive while the machine is off and boot with only one drive on? I think the overall impression we have gotten from this thread is that notification of RAID degradation in Windows 7 is unreliable if not nonexistent. You are the first one to find any notification, in fact. Understood. I originally had pulled the power on the secondary drive to get the errors. I let the array rebuild, created email tasks out of the 3 distinct errors. Now I've pulled the power from the primary drive. It generated errors (screen clip below) and sent me the emails I told it to. I guess the next step is let it rebuild, power down, unplug a drive and boot - In the real world, if your primary boot device is missing, you'll not be an idiot and you'll know there's a problem, so I only see merit in unplugging the secondary and booting. I'll see if that generates any knowledge of a degraded array. I'll let you know after I try it. In a perfect world, this would be more descriptive and throw an entry of "error" level into the system log. It does serve the purpose though. Did you program the messages in these pop-ups? Or is this something else beyond the events we have been discussing? In the real world, if your primary boot device is missing, you'll not be an idiot and you'll know there's a problem, so I only see merit in unplugging the secondary and booting. If the primary drive fails, Windows 7 will automatically boot from the secondary. It does advise you when booting, but then times out and continues into Windows. There was no notification in Windows. So if I boot the machine remotely and I'm not sitting at the console screen, I wouldn't see the notification. That looks like something else!!! Can you use processexplorer and use the 'sniper/bulls eye' button and drag it on this pop-up to identify the process throwing this warning. I am still discussing this with internal folks. So far I do not have an explanation as to why the events are missing. Thanks for your follow-up, Sumesh. Hopefully this discussion will lead to them improving the exception handling in Windows 8 if not in Windows 7. I find that RAID 0 is kind of a "well kept secret" way to get big system performance gains. People buy expensive (and tiny) SSDs to get 200+ MB/second throughput, when one can put a couple of good 1 TB spinning drives together to get that AND have a huge amount of storage. With high-reliability drives and good backup strategy it's not even unreasonably risky. Don't give them any ideas! RAID error notification needs to be fixed in Windows 7! This is a broken feature currently! They can make it "better" in 8, certainly, but it needs to be usable in Windows 7. I expect a hotfix for 7 to come out of this. Thanks for the update Sumesh. I really hope they fix it in Windows 7, but the reality is that unfortunately they seem to make very few design changes in the current release. This seems like more of a bug fix than a design change. RAID without error notification has to be a bug. I did some more testing and simulated a fail of the secondary HDD in the Mirror, unlike earlier where i simply removed a HDD when the system was shutdown. In this scenario, i got the following Event log. You can check if you have this event. Application popup: Windows - FT Orphaning : A disk that is part of a fault-tolerant volume can no longer be accessed. Ok. So RAID failure does invoke an Event in Win7 even though an obscure one, i.e. Event 26. It is also supposed to throw a popup, but doesnt for some reason which needs more investigation. This feedback is already in place for Win8 and you can see the following event in Win8 dev preview. Please note that it is an unfinished product. Also, are you explaining that there are two types of failure events? Loss of sync (id 142) and total failure (id 26)? I am assuming the difference between these is whether the redundant plex is detected or not. Are these events unique to RAID configurations? Is it possible to configure an a notification action for both events? It seems to me that either event should generate a popup. Thanks. Event ID: 26 [Informational] is already in win7. Event id: 142 is new to win8, and is in addition to Event 26. See screenshot. In Win 7 even though there is a informational event, it is a generic event ID/source, meaning there are several other scenarios which will generate the same event id, it has been improved/corrected in Win8 with the new event 142. As for the pop-up, it doesnt work as expected in Win7. I have passed on the feedback. what are the chances of seeing a proper unique RAID failure event added to Win7? Customers with a Premier contract with Microsoft can always submit a DCR (Design Change Request) to request product teams to review the design based on the business case (filing a DCR does not guarantee changes to design). A decision is taken after considering various parameters. Here's a kludge to get you thinking... If Windows won't generate an event then the only other option is to poll the system regularly, look for the problem, and notify you if/when it happens. Anyone have any ideas on how to get the status info via WMI? What other polling options might there be? Ouch! Found out today about no notification on failed redundancy. But now it is to late because of my primary disk has failed 2 days ago. Sadly the system wont event boot from the second disc. I checked the content of the second disk on another computer and the data wasnt mirrored for like 1 year. Bye bye to all the pictures. I hope you fix this soon. Or more people will be dissapointed. You keep making this point but it's not entirely accurate. SOME hardware cards have notification features, especially the more expensive ones that have their own ethernet port on the back. Others might have the ability to have a service running on the host OS that can proxy notification messages. Then there's the insistence that hardware RAID will somehow do a miraculously better job at this. That's just plain false. That and you actually have a lot more potential problems with data loss when an array goes bad. You're stuck with whatever interface was used to manage and operate the array. Whereas a software array might offer a lot more ways to gain access to the data should something go terribly wrong. So don't pretend using hardware cards are just better 'because'. They're not always the better choice. In the past, maybe, but not today. Does anyone know whether Windows 8 does any better job of storage asset management? It has the whole new "storage spaces" thing, but somehow I'm no longer optimistic about new features from Microsoft being done well or even right. Call me jaded. And Bill, we're in this very thread because Windows does a piss poor job of telling users about problems, while folks who use 3rd party RAID controller solutions are reporting the ability to better manage arrays. Can you justify saying that such solutions were better in the past but not today? Do you know of some new way things are now working that is different than what is reported in this very thread? FYI, I happen to use a HighPoint 8 channel RAID card and with it came software that alerts me if there are problems (even SMART status changes are reported), plus both boot-time firmware and software applications that allow me to do the things I need to do should I need to rebuild an array after a failure, etc. I just recently discovered Windows software RAID turns out to outperform cheap RAID controller cards. This wasn't true just 7-8 years ago; where there were closer, single-core CPUs in PCs. Now, modern multi-core CPUs can actually outperform many cheap RAID controllers. The only time I'd consider hardware RAID is for real RAID controllers with very abundant onboard memory. So, it's completely understandable the motivation for so many people looking for a small notification tool in the Windows system tray. I'm surprised there isn't a shareware that does this already. This suggestion is quite outdated; and, not necessarily appropriate for RAID 1 or RAID 0 anymore. It's actually quite desirable to use software RAID for RAID 1 and RAID 0; even over cheap hardware RAID cards or embedded controllers on motherboards. Enterprise class server hardware, isn't for everyone. Most modern computers sport things like integrated Intel southbridge controllers (e.g., ICH10R) that can provide RAID, driven and managed by the excellent Intel RST suite, so it's hard to imagine a modern system needing to go with pure software RAID. I hear the latest versions of RST even pass TRIM commands to array-resident SSDs. This is different, as far as I know, from plugging in two drives and having Windows itself combine them into an array. Plus building an array of spinning hard drives vs. SSDs stresses different things as well. Lastly, the term "outperform" itself is an oversimplification. What criteria do you use for that? I'd love to see actual performance results comparing the various methods of combining various types of drives into arrays. I'd find it hard to imagine that a pure software RAID driven by Windows would be better than something like RST that leverages the functions of the Intel chipset. You are the man ..... thanks a lot for this post. Having Software RAID as a built-in option seems like a great idea. No, not really. Software RAID is a bad idea, IMHO. It has performance issues and can be a pain to manage when failed. Being able to easily build a software RAID from two cheap 1TB drives gives me so much piece of mind ... or does it? Cheap and peace of mind should not be used in the same sentence, but I understand where you are coming from. It's safer with a good brand hardware RAID. Still, quality drives are better. Cheap drives don't just go bad, they develop media errors which span across the RAID and even ruin it. Update: In the previous thread, it was suggested I use the Windows Task Scheduler to make my own custom notification based on RAID failure events in the Event Viewer. The best way is to use a GOOD hardware RAID card that has an audible alarm. Microsoft Sysinternals has the BGInfo tool, which you can add vbscripts to generate additional data that gets included in the display. The contents of raidchk.vbs are below and belong to three websites, put together. The output of the script gets substituted into the display field. An improvement would be to WinTask schedule it to periodically update it. The length of the message output will dynamically "shift" the display front an center when a major event happens. The Vbscript could also include a. email, b. eventlogger, c. whistles and bells audio.. ect.. The reason the information is so hard to get at appears to be because VDS is a COM object based service, which brokers a user tool connection to vendor raid COM interface. There is no native wmi provider that will subscribe to the Microsoft RAID notifications and provide status information, let alone bind to a notification service like email or eventx. diskpart or dmadmin are the limits provided. But it almost looks like something Powershell could handle. status - A VDS_VOLUME_STATUS enumeration value that specifies the status of the volume. health - A VDS_HEALTH enumeration value that specifies the health state of the volume. TransitionState - A VDS_TRANSITION_STATE enumeration value that specifies the transition state of the volume. An application can receive volume events by implementing the IVdsAdviseSink interface and passing the interface pointer as an argument to the IVdsService::Advise method. To get the volume object, use the IVdsService::GetObject method. You can then use the IVdsVolume::GetProperties method or the IVdsVolume2::GetProperties2 method to get the volume properties. I say that without looking around very much. The recommended language for implementing a provider are C/C++ ect.. although I've never heard of a VB script wmi provider.. I think there would be data type language problems. Thus we are left with polling as with most scripting, or some sort of event trigger like a eventx alert that will run a script as needed. The Advanced XMLconfig for Windows Task Scheduler in Win 7/2008 is quite advanced and has a fine degree of control for matching events if there are events being logged by the VDS service with actual source data. VDS is on the way out, the COM interface is deprecated and will not support storage spaces, likewise the API and tools for Storage Spaces will not support VDS. This is a "take a leap of faith" moment. I tend to prefer to wait a year or two before trusting my data to the effort. As for Software vs Intel ICH vs dedicated HBA ? I'm interested at a low level for personal use, something easy and reliable beyond Tape backup or any system that requires me to perform an action, or allocate huge amounts of reduced performance time to feed the Tapes, feed the Backup service.. ect. I have tried every variation possible and come to the conclusion that at one time Hardware raid made sense on an enterprise level. But never the consumer. The RAID built into the motherboard tends to stay with the motherboard if that dies. Ditto with the HBA and its impossible trying to source a compatible HBA a season or two after the latest greatest hardware release. A long term available HBA is going to cost lots of money, because they have no other way to make back the money they could have made by releasing more new product, or to pay for the space to store the inventory. Ebay is not a great hardware vendor HBA sourcing plan. Tape backup and any major network backup system are too slow. At the same time, BIOS/UEFI being what it is, trusting a bootable volume to RAID between versions from the same manufacturer or differerent manufacturers is fool hardy. There is no incentive for cross vendor bootable RAID support. So plan to burn the bootable operating system drive, its expendable. Deliberately move the profile and data regions to either junction points or off to the mirror array. When a drive dies, replace it, when a motherboard dies replace it and reinstall the operating system. When all else fails, import the foreign "soft" raid mirror into another operating system.. and with 2003/XP being over 13 years old and still kicking.. that trumps any hardware vendor for longevity. If W7 lasts that long.. or longer.. it will be a good run. W8/2012 are in their infancy and have a lot of testing to go through in the real world. And for offsite replication, static archiving. There is always eSATA and an external drive that could be added to the mirror and subsequently broken. Being natively driven by the operating system I would suspect it would be reliable.. but testing is always the best way to shore up belief.
' not in a "Healthy" state. Returns 0 otherwise. Echo "Status of " & Redundancy & " " & Drive & ": (" & Description & ") is """ & RaidStatus & """"
Echo "WARNING: One or more redundant drives are not in a ""Healthy"" state!" It's hard if not impossible to get the same performance levels as you get with Intel RST and the chipset (e.g., Intel ICH10R) controller on the motherboard. For a small, inexpensive (the I in RAID stands for inexpensive) RAID setup you can't beat the Intel chipset based RAID controllers on modern motherboards, ESPECIALLY with SSDs. People may not realize that the additional complexity of an external RAID controller card with features like RAM caching actually add points of failure and can result in a system that could actually be more likely to lose your data. This is why there are things like battery backup options for expensive high-end RAID controller cards. 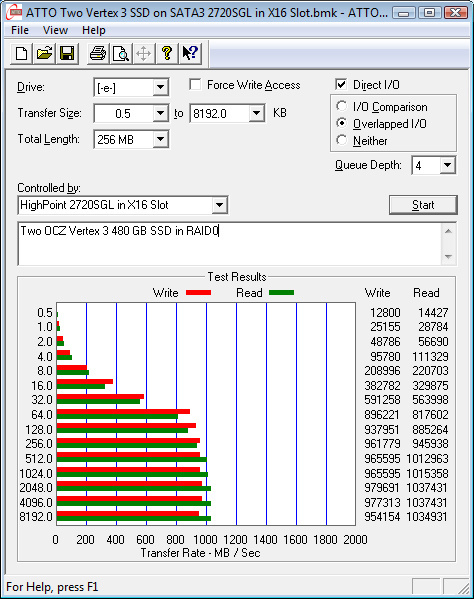 By the way, I have a PCIe RAID controller card myself (a HighPoint 2720SGL) as my workstation only offered SATA II ports on board and I wanted to take advantage of the higher speeds my SSDs could sustain. If my motherboard had had four SATA III ports controlled by Intel ICH you'd better believe I'd have used them. People focus on the numbers for large contiguous transfers, but most real-world I/O operations are small. For just two to four disks, benchmarking shows that on-motherboard Intel-controlled SATA II ports can deliver superior small I/O performance by comparison to almost all PCIe-based SATA III solutions, simply because the data goes a more direct way to get to and from the drives. The advice from SSD experts has most often been to use the on-motherboard Intel ICH10R ports for best all around Windows performance. 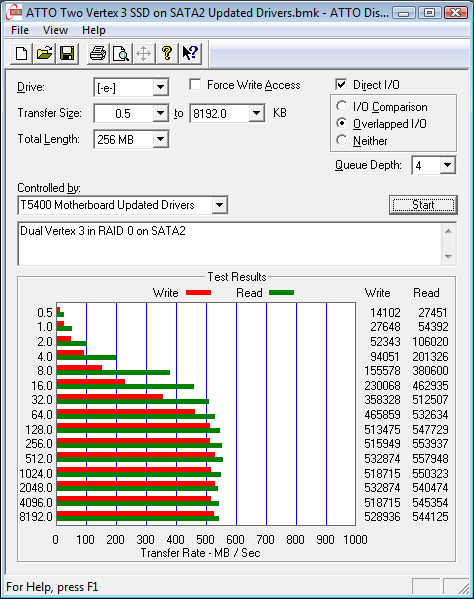 FYI, some comparitive test results with the same drives, comparing benchmark performance of varying size reads and writes between an Intel-controlled SATA II port on a Dell Precision T5400 motherboard and the same drives on two SATA III ports of a Highpoint 2720SGL controller. Note that the Intel-controlled RAID equalled or outperformed the PCIe controller solution up to 4 kbyte reads/writes. Only the larger I/Os showed the PCIe board's increased capacity with SATA III connections. A demo of the script working with BGInfo. In theory this should work with any RAID - software, motherboard, hba - this due to the VDS subsystem support that enabled diskpart.exe and other tools. It's just a guess, but I think 2.0 TB is the practical limit for XP/2003 - unless GPT loader from Paragon can extend that to larger volumes. But access to larger GPT spaces, 3 or 4 TB, does not guarantee access as a single volume. Disk spanning and other scenarios aside. I tend to think its best to leave well enough alone and move on towards Windows 7 for the next decade. 8/2012 concerns me at the moment, it feels like a test version that may not stick around, so I'm not too invested in looking at it for now. To be clear, just because this used the vbscript above, nothing precludes using Powershell to access the COM interface of VDS directly. And in doing so access the finer details about status, even rebuilding status. The most advanced scenario for scripting might be to register an event that triggers an update to the BGInfo display. eventcreate /ID 999 /L SYSTEM /T ERROR /SO SW_RAID /D "%eventtext%"
Justin, that's a useful script and I have bookmarked it thanks. Having said that, I find myself agreeing 100% with the original poster. RAID is critical system function. If you are going to enable the capability at all, then how difficult would it be to have a system gadget tied into the RAID status that notifies you when there is a RAID synch failure or error? It extends the usefulness and reliability of the feature at least 300%, because most people won't catch a failure on their own. +1 to Vegan Fanatic's comment. I've been using RAID for decades without problems - and I still do nightly backups that can be restored to bare metal. But the comment shouldn't stop at RAID. Enterprise class / high MTBF drives aren't even twice as expensive as an el-cheapo model. They are NOT created equal, and if you value your data - which you should - you should consider getting the best disk drive you can for any configuration. The original question has nothing to do with the quality of your hardware. The best hardware in the world occasionally fails. The mirror is a critical volume resource to the operating system. If it fails for any reason (like human error because someone turned off a piece of hardware without realizing they did it), all the original poster is asking for is the OS to urgently and explicitly give notification of the mirror's failure. People in this thread are working WAY TOO HARD to defend the status quo. The requested functionality is trivial to implement, and useful beyond question to everyone. This is what I've been using successfully for the past year. I just created a task that sends me an email every X hours and tell me if my RAID1 is Healthy or not. You can create the task so that it sends you an email every hour if you want. That being said my RAID1 is not filled with very important files. It's just a home share. So 3 years after the OP posted, I take it there is still no official solution from Microsoft for Windows 7? What about Windows 8? I'm about to buy a new laptop, and I'll have the choice of using Windows software RAID or the Intel RST RAID. Someone mentioned in this thread that Intel has software that provides a system tray icon that will notify you if there's a problem with your RAID array. Seems obvious that using Intel to set up a RAID array instead of Windows is the way to go. Intel RST is quite highly regarded and has substantial features like low level I/O caching integrated with your system RAM. You'll see that SSDs RAID very well with it, if you read the SSD forums. I have been watching this thread for some time, but I am no longer holding my breath for any assistance from Microsoft. When I start my workday, I confirm all my drives are Healthy, close it, and move on. While I agree this is a poor workaround, I at least know that all my RAID arrays are in good shape each morning. If anyone comes across a true solution, please share. Edited by SeanRiddolls Monday, March 14, 2016 4:48 PM minor adjust to reflect the release of newer OS releases. Another 3 years has elapsed--still no fix. I just discovered a missing drive (data, not system) and was surprised at not being told about it. Hit #1 about the problem is this thread.